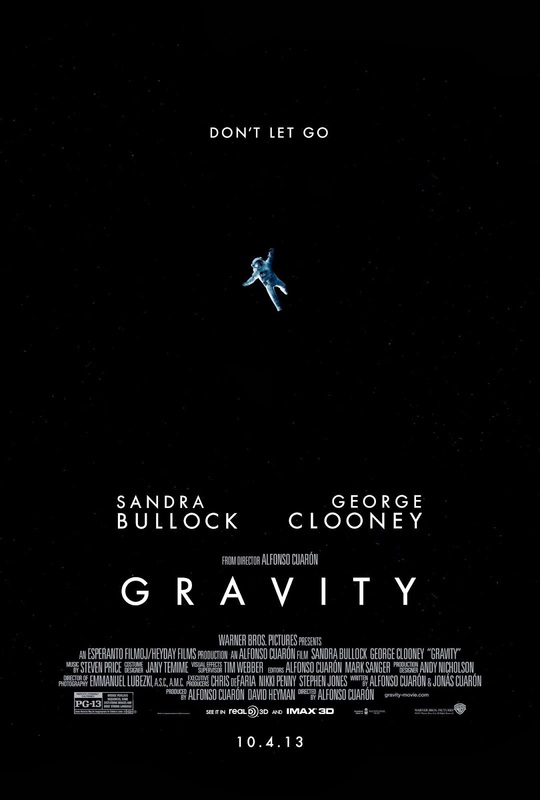 I'm not always right, but to say at least one nice thing about Gravity, when I am right, it's because there was an obvious flow to the storyline that made its choice of symbols inevitable; okay, that was the soft side, now onto the real issues at hand. There is no possible way this movie can be anything other than a pro-communist, anti-American, anti-capitalist work of Marxist propaganda and the film accomplishes this through a constant stream of important details. The symbols are all symbols we are used to, but they have fully been employed for a socialist agenda we have all ready seen, and will continue to. 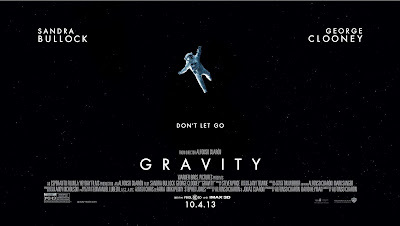 "Don't let go," is the tagline. There are two, clear agendas in the film: the first is, Americans don't belong in space, the second is, you have to be tethered in order to survive. From the very first words that come up on the screen, we know space is a terrible place to be, no one can survive in space. Dr. Stone, after everyone has died except her, says to herself, "I hate space," because the film makers want YOU to hate space. When I was in third grade, our elementary school--like every other school in the country--gathered us into the gym to watch Christa McAuliffe be the first teacher in space, which resulted in the Challenger space shuttle disaster right before our little eyes. When I was a sophomore in high school, our debate topic that year was increasing space exploration, and you know what NO ONE proposed? No one proposed human space exploration because ALL OF US had watched a civilian teacher die in an explosion when we were little kids so we were the generation that grew up believing space exploration to be bad. Socialists LOVE that about Generation X, our innate fear of space and what can happen, and they go to extraordinary lengths to insure that you are exhausted and never want to see anyone "punished" with being put in space again by the end of the film. Is that how you felt at the end of Star Trek Into Darkness, when you hear Captain Kirk (Chris Pine) saying the iconic lines, "To boldly go where no man has gone before?" No, that's not how you feel, you feel exhilarated because you know the crew of the USS Enterprise is going to face hardship, but they will come out stronger and wiser for it (this is the theme we have been seeing in pro-capitalist films, no one likes to suffer, but fighting our enemies and enduring challenges makes us stronger, better people; on the other hand, socialists want us to be afraid of suffering--as in Gravity--because no one wants to suffer, and if the government takes care of you, you never will suffer, so they want you to believe; please see The Enemy Of My Enemy: Star Trek Into Darkness for more). Remember Men In Black III? The space shuttle HAD to be launched in order to protect us from the threat posed by Boris (symbolic of communism in the Soviet Union) and because the US won the space race, that guaranteed we would not be over-run by socialists (please see Men In Black III & the Victory Of the Cold War for more). The destruction of the Explorer space craft is both a destruction of the American pioneering spirit taking us into space, and, what leads us to our next point, the destruction of that "ship of state." This is the only "fault" I site with the film, but we also saw this kind of logic in The Conjuring (which was also pro-socialist) regarding Mary Towne Eastey and the Salem Witch Trials; the space craft Explorer is the pre-Obama government, but it's also the ship of state to which you want to be tethered or else you will die. Take a good look at that image up above; how terrible, right? Who would want to be drifting in space with no chance of rescue? The many tethers and ropes we see in the film act as a symbol of the umbilical cord--which we also saw in Star Trek Into Darkness, on two occasions. The umbilical cord has a two-fold meaning (the second of which we will discuss below) but the primary purpose is that of the "life line" and to make sure that you have one so you aren't "stranded" in space, i.e., you aren't trying to make it in the inhospitable world of American democracy without food stamps, an Obama phone or Obamacare, because Obama is your lifeline and you're going to die if you let go, so they want us to believe. There are only four actors in the film: Dr. Ryan Stone, Matt Kowalski (George Clooney), Houston Control (Ed Harris) and Shariff (Paul Sharma who dies). We have seen a character like Houston Control before: The Eternals in R.I.P.D. (this isn't the only reference we will make to that film). As in R.I.P.D. and The Eternals being removed and just barking out orders, Houston Control is also removed and unable to do anything, which is ironic because those are the exact characteristics of socialist governments. Another case in point: Shariff appears to be Indian (American from India) and we never see his face except after he is dead; why does he die? Technically, a piece of the satellite debris severs his face in two, but realistically, just as we saw in Gangster Squad, Shariff dies because,... he went to Harvard. There are several metaphors or allusions to Dr. Stone giving birth, the first just happens to be the very first words we hear her saying about nausea which references morning sickness (not that she's actually pregnant, but she is in a symbolic way). The next is her desperate need to hold on to the life line, the tether that looks like an umbilical cord after she's been detached and satellite debris fills the air around them. In the scene above, she has managed to be the sole survivor of the Explorer disaster (Kowalski is presumed dead or about to be) and she has taken off her space suit inside the ISS and basically curls up in the fetal position in zero-gravity and, with tethers and cords flying around her, she looks like a fetus, as pro-choice people say, or a baby as pro-life people say. Anyway, this is imperative for the agenda of the film, because it plays into our understanding of who Dr. Stone is politically: America. We know she has a daughter, but there is no mention of Mr. Stone (or her one-night stand or whoever it was) so it's possible she was artificially inseminated (more on her daughter and death below). So, not having any "background" on Sarah Stone, her daughter, it's possible Sarah was "grown in a tube" the way her mother's re-birth takes place in the scene above. Why is this important? We have seen these instances in both Oblivion (when Jack [Tom Cruise] goes aboard the Tet and sees the children "growing" in artificial wombs) and in Man Of Steel when Russell Crowe's character goes to get that history/archive thing to send with his son; in other words, Oblivion and Man Of Steel both demonstrate how communists prefer to "grow" people rather than nurture them, and this is demonstrated in this scene with Dr. Stone (it's also validated by the Looney Tunes' character of Marvin the Martian, discussed below). On a different note, Stone is quite androgynous in the film, she's mostly in her bulky space suit, but even when she's barely wearing anything--like above--she hardly has a feminine figure, compounded by her super short haircut (I even thought she looked sick, which is reasonable given the circumstances of the story, but it adds to her lack of looking like a woman). Now, we know that Kowalski asks her, "What kind of name is Ryan for a girl," and she replies, "Dad wanted a boy." Part of this we will discuss below with why Kowalski dies, but it also works to unite feminists to this main character because she has to be manly rather than a traditional female role and her name (including "Stone") adds to her lack of real identity. Why? Normal movie-goers knows this is a bad deal, but lots of liberal critics like it; why? Because they are socialists and socialists don't believe people should have individual identities. Stone doesn't really have an identity, she comes in and does her job and that's it; Shariff, on the other hand, is in space, enjoying himself, bouncing around and "doing something like the macarena" and that's bad, because he has a personality (like Kowalski, which is one of the reasons he dies) and so Shariff has to die because he has personality. Harvard has the reputation of being the "best" school, so anyone who went to Harvard is either one, elitist or, two, the best at what they do, and for both of those reasons, in a socialist government, that person has to die because anyone who is the best at what they do are probably too smart to tolerate a socialist government so they are smart enough to rebel and overthrow that government so the government has to purge them (and I think we are going to see this again with Keanu Reeves' film 47 Ronin). Shariff also dies because he is from India, and socialists right now REALLY hate India because it's a blooming capitalist economy (please think of The Best Exotic Marigold Hotel). We don't see what Shariff looks like until Stone has gotten his body and a piece of space debris has blown off half of his face; why? Socialists want to make capitalism look like IT is the system that prohibits people from developing their personalities, like people who are capitalists don't have any personality or identity, that socialism is the philosophy where you really grow as a person, but that leads us to Kowalski. Even though we like Matt Kowalski (George Clooney), he dies in the film, and what have we been saying? No one dies in a film unless they are "all ready dead"; but he doesn't die, Clooney fans might argue, he sacrifices himself; BUT, the film makes it a point to show us that they could have "brought him back" the same way it "brings back" Stone's character from suffocating, but the film wants us to know it chooses NOT to save Kowalski; why? If this isn't the exact same prayer card we see in ISS, it's pretty close to it. This is Saint Christopher; how do I know that? Because each saint has a particular virtue, a unique story, which draws out the singular destiny given to them by God and how they fulfilled it in whatever station in life God gave them (and everyone single one of us has this, but not all chose to answer God's call, or we do not answer it as perfectly as we should, like the saints do). Christoper was a strong man who carried people across a river; one day, a child (pictured on his shoulder) asked Christopher to carry him and the child grew heavy as lead; when they got to the other side, Christopher told the child how heavy he was, as if he had just carried the world on his shoulders, and the child replied, you have, and Him Who made the world, and then the child disappeared. 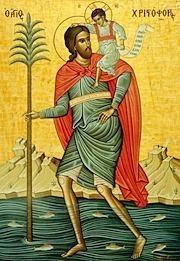 For this reason, St. Christopher is the patron of travellers (Catholics ask St. Christopher to protect them before they go on a journey by interceding on their behalf before Jesus, and give thanks to Jesus through St. Christopher at the end, and ask for his help if they encounter trouble during). 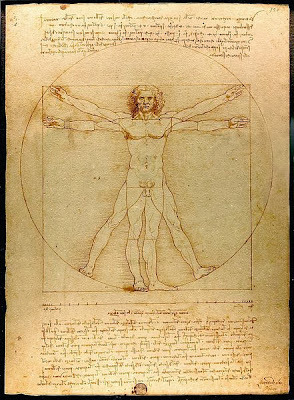 Now, this image above is, in some ways, exactly like Da Vinci's Vitruvian Man, in that, we see all the "dimensions" of St. Christopher, and yet, it's the exact opposite because Vitruvian Man is only the physical, but the icon above is the spiritual plane. For example, the gold background alerts us that this is not a REAL scene, and yet it's a scene whose reality transcends reality, and that's the key to understanding icons: they are abstract so they can convey more intangible information to the viewer. As C.S. 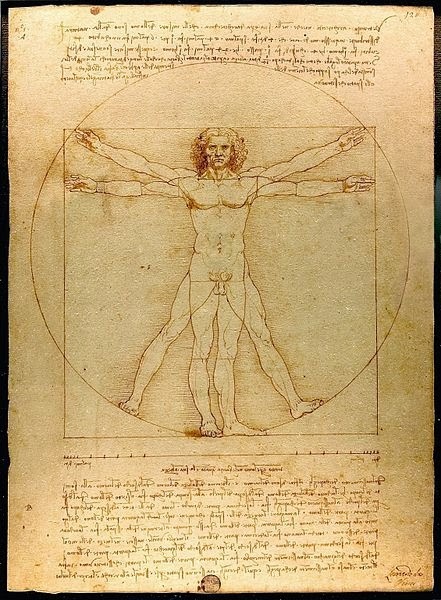 Lewis said, you are not a body, you are a soul; you have a body. We can see the truth of that in the icon above, because--even though St Christopher was reputedly 7.5 feet tall, that's not a real body (look at his knees, meant to symbolize his humility that such a big man could be brought low by a little child). His clothes aren't "real clothes" (the green garment symbolizes his "hope" of serving Christ, and his red cape on his shoulders is the sacrifice for love he made by serving people who needed to be taken across the river). The river isn't a real river, but symbolic of the Grace working in and on St. Christopher every day and every time he carried someone across the river; likewise, the fish symbolize those converted to Christ through Christopher's example. The mountains in the background (often referred to as "cheese" mountains, because they look like blocks of cheese) are there to symbolize, not only Christopher''s sins he had to overcome, but also the sufferings and challenges which Christ sent to Christopher to help him become holy. Christopher's face mirrors the face of Jesus often seen in iconic depictions because Christopher successfully transformed himself into becoming like Christ in his humble occupation, and so achieved his own unique individuality. So, these are all the "dimensions" of spirituality we see in this prayer card that we don't see in the Virtuvian Man. This is what, as Christians, we are called to live for, our unique calling which God has prepared for us and prepares us for by trials He sends us to strengthen us and rid us of sin. This is why Karl Marx said religion is the opium of the people, because--in hardship and trouble--we actually find solace in knowing God is in control and we are going to receive Grace to sustain us. Marx doesn't want us to believe that, he wants us to believe we are all alone and we need the government--not God--to provide for us and what we really need is to take from the wealthy and evenly redistribute amongst ourselves. This is why socialists hate Christianity and want us to fear suffering and why they really don't understand why we cling to our religion and refuse to give it up. On the other hand, why didn't anyone ever teach Dr. Stone how to pray? While socialists accuse America of being a ridiculous Christian country on the one hand, they then turn around and accuse us of being a "godless country" on the other: you claim to believe in God, but you don't pray. Now, there are two different ways that can also be interpreted: one, that America has always been so strong, we didn't "have to" pray to God because we "didn't need His Help," (remember, these are socialists who created this character, not Christians) and the other possibility is that Americans don't know how to pray to the Central Government from who all help and aid comes (in this case, Houston). Kowlaski is from Texas. He listens to Country music (It's Hard To Find Angels by Hank Williams is what he plays in space), he tells stories, he's heterosexual (if he were homosexual, he could be saved) and--this is the worst part--HE'S TRYING TO BREAK A RECORD; wait, no, that's not the worst part, the worst part, the real reason he's a villain, is because, brace yourself,... he's a WHITE MALE. That is why he's a villain, that's why he has to die. First, Kowalski--loving space and all his other characteristics--represents American bravado, what we see in Douglas MacArthur (Tommy Lee Jones) in Emperor, and Captain Kirk in Star Trek Into Darkness, and Tony Stark in Iron Man 3, etc., so he's got that American spirit socialists hate in America. Secondly, he symbolizes the "power base" or power holders in this country, white males. Whenever socialists move into a country, they unite all the minorities, and target the white males, which is what we have seen in both Skyfall (James Bond is a gun target in the opening credits) and The Croods (the father figure is a bumbling idiot). So, if the film makers hate him so much, why do they bring Kowalski back from the dead? Marvin the Martian from the Looney Tunes; why would they include a little figure of Marvin flying out of Explorer when Stone and Kowalski look for survivors? Marvin made his debut in 1948, at the end of World War II, and--as we have noted before--socialists HATE World War II because America won and defeated socialism utterly. Through the figure of Bugs Bunny, Americans were dominating space before we ever even got to the moon, so it was art that first launched us there, especially the movies (because the cartoons where people first saw Marvin were at the cinema, not at home on TV, they went to the theater to see them then). What do you remember Marvin doing? He always wanted to destroy earth "just because" it was in his way, and he was always raising an army by using a seed he then watered that instantly grew into a huge "thing" that did his evil will, but had no identity of its own (just as we discussed above with Oblivion and Man Of Steel, and even in Gravity with the "growing of humans" rather than natural procreation). 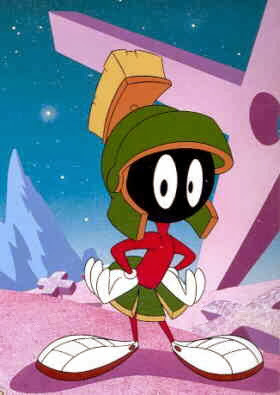 So, we can see Marvin the Martian as a great representation for communism that had introduced the start of the Cold War and, through the separation caused by the Iron Curtain, the Soviets seemed to be on "another planet" because they were so removed from us. Not to mention, Marvin is dressed as Mars, the "god of war," because (as we also saw in Star Trek Into Darkness) making war is what socialism/communism does, it doesn't want peace, it wants to destroy the lives of everyone and conquer them "just because." So, by the figure of the villain Marvin flying out into space, so, too, do all of Bugs Bunny's victories against him (i.e., America's victories against communism) and we can add, our notions of what communism is. But are we really wrong to see socialists/communists in this way? No, because Gravity re-enforces exactly what the caricature of Marvin the Martian is: look at his face. Oh, he doesn't have a face because socialists don't believe in personal identity, just anonymous beings who are bodies. He doesn't have a mouth of his own because he's only a mouthpiece for the writings of Marx, Lenin and Stalin. Marvin goes flying out of the Explorer because socialists want to make fun of how they have been portrayed, and yet, through Gravity, they prove that is an exact replica of who and what they are. There are two minor details supporting this interpretation. First, as Stone looks in the Explorer a dead woman suddenly appears in front of her; I don't know about you, but this reminds me of Steven Spielberg's Jaws, which, in its day, was a pro-America film justifying World War II (I am thinking of the part in Jaws when Richard Dreyfuss' character is scuba diving and discovers the boat with the fisherman who had gone fishing for the shark earlier and one of the corpses suddenly appears in front of him from out of the boat; please see Jaws & the Cleansing Of America for more). Through using the symbol of the shark as a Japanese submarine, and the blowing up of the shark to symbolize the atom bomb, Jaws validated the reason America went to war and America's victory, so linking the catastrophic destruction of the Explorer space craft in Gravity with Marvin the Martian and the defeat of Jaws the shark is an attempt to re-write American history, which leads us to the third detail: that pen that keeps flying around Dr. Stone when she's in the space stations. Details like that don't "just happen," they happen for a reason and with a design in mind, that's because, the film makers want to communicate to their fellow socialists in the audience (because they are confident we are too dumb to pick up on something like that) that they are rewriting American history so we look at ourselves as being stupid and conformist rather than viewing socialism as evil, corrupt and soul-less. To demonstrate they really want him dead. And we know this because, when he has been temporarily "saved" from death, and he is inside the ISS with Stone, what does he do? He drinks the vodka. Unlike Stone, Kowalski hasn't learned his lesson, Kowalski drinks "what the Russians have drunk" which leads us to why it was a Russian satellite that destroyed the space ship. What else do we know about Kowalski? He tells stories. Why? Because Americans tell stories to remember our history, that's another reason why he dies, he keeps the memory alive and that's why that pen keeps flying around Stone when she's in the ISS and Chinese station, because the film makers are re-writing history and they don't want any Matt Kowalski stories interrupting them. Another thing we know about him, is he has a bad feeling about this mission, the same bad feeling back in 1997 when his wife ran off with a lawyer. Well, who was a philandering lawyer in 1997? Bill Clinton, who was sworn in for his second term that year. Just as Stone offers a traditional symbol of the motherland, America, so Kowalski offers a traditional symbol of the economy, the active principle of what makes the country productive (women symbolize the passive principle, men symbolize the active principle, even socialists can't squirm their way around that one). SO, what that story about his wife tells us is, his wife (also a symbol for the motherland) left him (a traditional, American capitalist from Texas) for a philandering lawyer, (Bill Clinton), i.e.,e the country started going socialist in the second term of Clinton's Administration, which is also what Pain and Gain tells us because that story about "wealth re-distribution" also takes place during the second term of Clinton. What does the story about Mardi Gras mean? "His girl" was holding hands with a hairy--and he doesn't finish it, so it probably means a short, hairy woman, that is, women would rather be with a short hairy woman than with George Clooney, and in support and advancing of socialism, George Clooney has sacrificed himself to make that point that women should really prefer other women to being with men. Now, on a typical contradictory note in this film, the tagline is, "Don't let go," but what does Kowalski tell Stone she has to do? Let go. We see socialists inability to keep to their own preaching also in World War Z: remember when the family is stuck in traffic, and Gerry (Pitt) gets out of his car after his rear view mirror has been knocked off and a cop comes by and tells him to stay in his car? In another moment, everyone starts turning into zombies, and they can't stay in their car, but that is another example of how socialists want you to blindly follow their rules, but they change them the very next instant. Kowalski symbolizing the economy is why he is the one who is competitive (capitalism is based upon competition), trying to break the space-walk record: competition is bad, if America hadn't competed to get into space, none of these bad space accidents would have happened and the Soviet Union wouldn't have fallen, it would still be around, and then America would have had a much smoother transition to communism, but competition is the reason he has the jet pack (seen on his back in this image above), but the old fire extinguisher Stone uses to get to the Chinese station is just as good as that fancy contraption, isn't it? The Russians have not fared well in American films of the last year or so, however, there are two films in particular--Oblivion and Madagascar 3--that have championed Russia as the "new American ally" because of their commitment to capitalism and Gravity seems to side with Oblivion and Madagascar 3, but not in a good way. 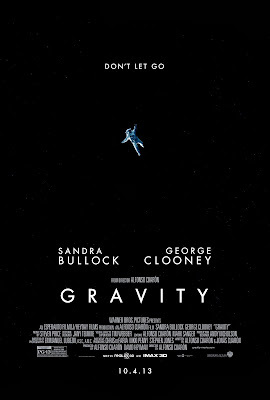 The terms "gravity" and "satellite" are actually political terms in this space film, because the damage done to the US Explorer space craft comes from the Russian's blowing up one of their spy satellite's, which sits off an unintended chain reaction that causes other satellites to explode and creates an enormous debris field damaging all these ships and station. Why does Kowalski appear out of nowhere in the ISS and tell Stone about using the soft landing gear as thrusters to get over to the Chinese space station? Because it's essentially "knowledge re-distribution." That's the kind of thing Kowalski would know, because he's a veteran, he thinks like that, Stone wouldn't know that or be able to come up with that because she's too rigid. Having him "show up" does two things: first, it gives film makers a chance to kill him a second time when she looks back at him and realizes she was hallucinating (which is something that might have been taken from Max Brooks' novel World War Z when a pilot crashes and she's in Zombie land and she thinks there is a woman on her radio helping her through but discovers later there wasn't). The second thing this accomplishes is allows Stone to get credit for an idea she could not possibly have come up with. Kowalski couldn't have told her to use the soft landing gear, he's dead, so she must have come up with it on her own! Hooray for feminism! We don't need men! Again, there is NO WAY she could have come up with that idea on her own but she gets credit for it. Now, why does Kowalski drink the vodka? Because he and the Russians are both drinking in capitalism. So, in a round about way, Gravity gives Russia a compliment many capitalists aren't willing to pay it: Russia is strongly capitalist, so much so, that it's now discouraging capitalism in other parts of the world. The "Russian satellites" Russia has destroyed refers, politically, to the satellite countries of the Warsaw Pact and Baltics who first declared independence from the Soviet Union, which created pressure for Mikhail Gorbachev to liberalise (in terms of the move from communism towards democracy) reforms in the Soviet Union, so the satellites were allowed by the Soviet Union to declare independence which in turn created the dissolution of the Soviet Union and the fall of socialism internationally. In terms of the film Gravity, what do capitalists always say about socialism in America? It didn't work in the Soviet Union! So, the debris from the fall of the Soviet Union is what makes it impossible for America to convert over to socialism "naturally" and that's ruining the "exploration" of Obamacare in America (please remember, Dr. Stone is a medical engineer installing a "scanner" that is basically jargon for a machine that is going to scan all your internal information and store it so the government knows who is healthy and who should die). Desolation is perhaps the most important character in films of 2013-14. From the next The Hobbit: the Desolation Of Smaug, to the desolation of Tony Stark at the start of Iron Man 3, to the destruction of the USS Enterprise in Star Trek into Darkness, the desolation of earth in World War Z, and many other films, desolation for capitalists makes us stronger, but for socialists, it is what is to be feared, as in the image above of all the nothingness. Here's the trick though: socialism always destroys nearly everything, leaving desolation in its wake (just look at what the Soviets did to Russia after taking power, and then to the Eastern European countries after taking control of them at the end of World War II). Very few people think the US is in better shape today than it was in 2008 because NOW we are $70 trillion dollars in debt and millions more people are on food stamps and other forms of government assistance, so the country is being destroyed intentionally but socialists won't ever admit that. Why does Stone have such a hard time getting free of the Russian space station? The parachute "holds her back," she's afraid to get to the Chinese station because she knows what happened in the Soviet Union and if socialism didn't work there, why would it work here? Usually, parachutes are for safety, but in Gravity, they keep Stone from "getting to safety" of the Chinese station. Why does Stone start howling like a dog when she hears that AM radio station? It's to bring out her "animal side" and that it's so much easier to be an animal than to worry about someone praying for your soul in religion. Lastly, at the start of the film, and about mid-way through, there are shots of the earth that makes it look like there is a massive hurricane; nothing is ever said about this "storm," but we shouldn't be surprised because storms are synonymous with chaos, and as the new trailer for Jack Ryan Shadow Agent reveals, there is a "storm brewing" that we will never see coming but will bring us to our knees without a single shot being fired. In conclusion, Gravity is a political term about the United States "falling" from the heights of a Super power to the muddy shores of China because socialism is going to be the gravity that brings us down to the level of all other nations. 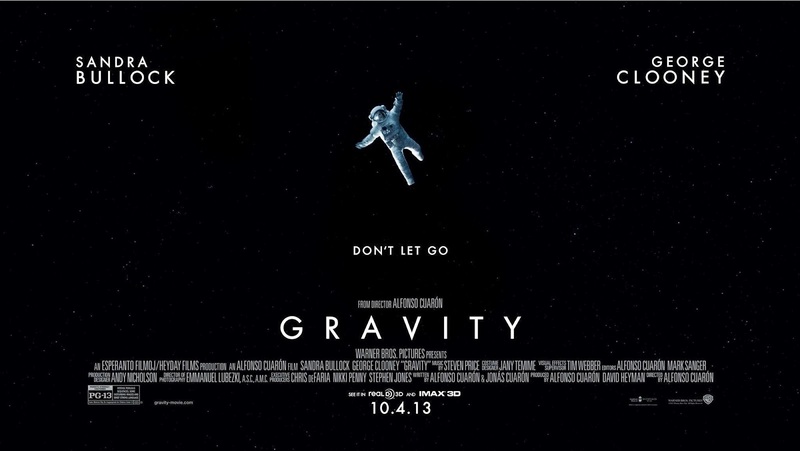 This is a film in direct dialogue with films like Star Trek Into Darkness that celebrates America, because Gravity wants America to become as utterly destroyed as the space station Explorer, precisely because we have explored, and allowed others to do so.